U.S. President Donald Trump says a meeting with North Korean leader Kim Jong Un will take place as planned in Singapore on June 12. The announcement reversed an earlier decision from Trump to cancel the meeting on the North's nuclear program. 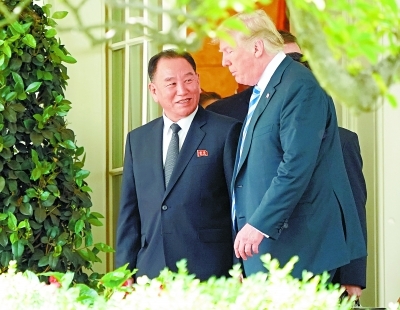 The president spoke after meeting for more than an hour with Kim Yong Chol who delivered a personal letter from the North Korean leader. Kim is the vice chairman of the North Korean ruling party's central committee and a former intelligence chief. The president told reporters "we're going to deal." He said it was likely that more than one meeting would be necessary. He added, "I think you're going to have a very positive result in the end. We will see what we will see." When asked about the letter from Kim, Trump called it a "very nice letter" but said he had not read it. He added with a smile, "I may be in for a big surprise, folks." The president said the U.S. government would not put in place any new sanctions while talks were taking place. He said signing a document officially ending the Korean War could be discussed at the upcoming meeting. Trump also said the two did not talk about human rights. And he believed Chinese President Xi Jinping supported the talks. Trump said he believed Kim Jong Un would agree to denuclearization. However, questions remain about what a deal on the North's nuclear weapons would look like. Kim is the highest-ranking North Korean official to visit the U.S. in about 18 years. On Thursday, Kim met with Secretary of State Mike Pompeo who also attended the meeting at the White House. He claims that several countries have developed nuclear weapons secretly. The United Nations Secretary-General has spoken of the need for individual freedoms and human rights. In the end, we all decided to organize a concert for Easter. This is the box wherein she keeps all her personal letter. 5.U.S. President Donald Trump says a meeting with North Korean leader Kim Jong Un will take place as planned in Singapore on June 12. 6.The president said the U.S. government would not put in place any new sanctions while talks were taking place. The restrictions have been put in place, after a five-day national strike.